You'll find plenty of places to visit near Chennai (Madras): Mahabalipuram (Sea Shore Temple, Monuments at Mahabalipuram, & more). And it doesn't end there: identify plant and animal life at The Madras Crocodile Bank Trust and Centre for Herpetology, stroll through Marina Beach, take a stroll through Fort St. George, and make a trip to Indian Institute Of Technology, Madras. 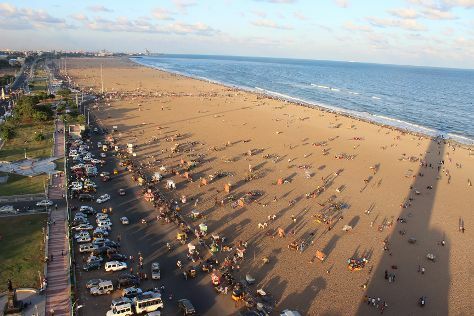 To see ratings, photos, and more tourist information, you can read our Chennai (Madras) trip planner . If you are flying in from India, the closest major airport is Chennai International Airport. June in Chennai (Madras) sees daily highs of 43°C and lows of 31°C at night. Finish up your sightseeing early on the 9th (Sat) so you can travel to Edinburgh. Edinburgh is known for historic sites, museums, nature, nightlife, and childrens museums. Your plan includes some of its best attractions: examine the collection at Royal Yacht Britannia, take some stellar pictures from Calton Hill, engage your brain at Camera Obscura and World of Illusions, and make a trip to The Royal Mile. To see other places to visit, photos, more things to do, and more tourist information, refer to the Edinburgh travel route planning site . Fly from Chennai (Madras) to Edinburgh in 16 hours. Alternatively, you can do a combination of flight and train. The time zone difference moving from India Standard Time to Greenwich Mean Time is minus 5 hours. Traveling from Chennai (Madras) in June, expect Edinburgh to be much colder, temps between 20°C and 10°C. Wrap up your sightseeing on the 12th (Tue) to allow time to travel back home.